The year was 2005, and here in the U.S. we were living a media blitz of full-out post-Katrina demonization of nature. This wall drawing accompanied the series of small "Wide-eyed Apollos" hung on adjacent walls. 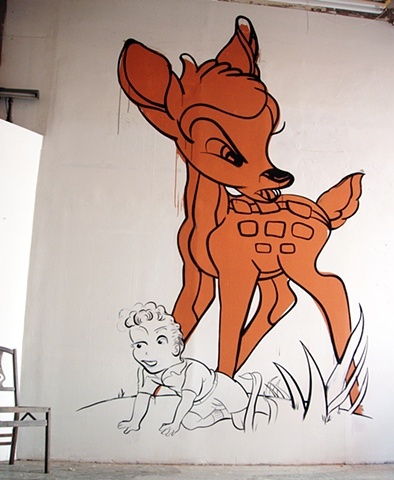 A five year old child wandered into the gallery, looked up and observed: "Bambi's angry!". Her mom explained that Bambi was angry because humans were not being kind to Mother Nature. The child looked up and exclaimed: "You mean, like, global warming?"